Summer is about colour – everywhere! Old favourites are in full bloom so you need more of them. The best news is the availability of modern dwarf hybrids of many perennials and edibles, which can be planted and enjoyed in the smallest of spaces! Container gardening is gaining popularity by the day and what’s not to love about it? from the traditional and pretty decorative pots, to gumboots and repurposed wooden pallets, the variety of different containers you can use is endless. Plant blueberries, strawberries and Cape gooseberries in large pots. They say that the blueberry (Vaccinium corymbosum) is one of the world’s super foods due to a high concentration of antioxidants, and luckily for us, good blueberry varieties are now readily available – just in time for those scrumptious summer smoothies. Plant them in full sun in a space which will allow for a mature height of 1,5m and a spread of up to 2m wide. You can however, also plant them in a large pot. Blueberries like moist, acidic soil so mulch them with acid compost or pine needles, and feed them with a fertiliser formulated for blue hydrangeas. Brachyscome Magenta – tons of bright magenta blooms cover these mounded plants all season long and is ideal for containers and garden beds. The plants are sensitive to overwatering, and for optimal performance, can be fed with a slow release fertiliser to encourage blooming. Plant these beauties in full sun. They reach a height of between 15 to 30cm and width of 15 to 20cm. Petite and huge blooming beauty – dwarf Inca lilies are magnificent for the garden and suitable to grow in containers too, as they reach a height of only 30-35cm. They flower profusely from spring to autumn and can be found in a wide range of bright colours. These shorty’s can, just like their taller family members, be picked as long-lasting cut flowers. Hydrangeas – brighten up shady areas with glorious hydrangeas, which will now be available in flower. Colour in between them with impatiens, begonias and browallia. Hydrangeas love dappled shade, rich loamy soil and lots of water. If you want to grow them in pots, place them on the Southern side of the house for early morning sun and afternoon shade. Plumbago Royal Cape – huge clusters of vivid deep blue flowers cover this sprawling, vine-like shrub most of the year. It is a reliable evergreen and can be used as a groundcover, bank cover or container plant in frost-free areas. Statice (Limonium perezii) – an evergreen perennial that forms a rosette of large, leathery leaves. It grows in the sun in most soils as long as it is well drained. It is drought tolerant once established, but needs regular watering when newly planted. This is a reliable low maintenance plant. You only need to remove the old foliage to keep the plant tidy and looking good. The Statice plant flowers year-round but has more flowers in spring and summer. It has large clusters of bi-colour blooms on stems ranging from 15-60cm tall. These flowers are purple-blue and white and have a papery feel to them. The flowers last forever and are excellent cut flowers – both fresh and dried, as they retain their colour. Remove the old flowers to encourage new flowers to develop. Butterflies and bees love the flowers. Hardy bedding bestie – Portulaca! Portulaca grandiflora varieties are annual succulents flowering their hearts out in summer to autumn. They mature at around 15cm in height and 30-40cm in width. The reddish coloured stems are prostrate and green cylindrical leaves are arranged in clusters around the stem and pointed at the ends. Both the stems and leaves are thick and fleshy. The flowers, formed at the tips of the stems, are rose-like in appearance and have either single, semi-double or double petals. The colours tend to be bright such as scarlet, orange, yellow, pink and white, although there are some cultivars that have been bred to have a more pastel palette. The best uses for this plant include the following: in a rockery, between stepping stones as groundcover, or in a hanging basket. The trailing habit of this plant makes for an ideal companion in containers, as it will spill over the edges magnificently. 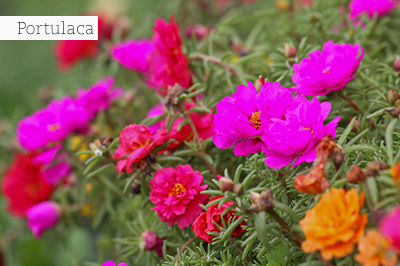 Portulaca enjoy sandy, well-draining soil and a hot, sunny position. Infestations of red and two spotted spidermite have the following symptoms: Fine, pale mottling with small reddish or two spotted mites on the underside of leaves and stem. In severe cases, a fine silk web will be apparent and leaves lose their green colour. Leaves fall off and such weakened plants may die. Treat with an oil based insecticide. Bro’s growing in the air! Airplants (Tillandsias) are part of the epiphytic bromeliads which live off moisture and nutrients in the air. Their roots are insignificant and the hard leaves are mostly grey or white and covered in small scales, which absorb water and food. Probably the most well-known air plant is Spanish moss or old man’s beard (Tillandsia usneoides), often seen hanging like grey curtains from tree branches. But, there are more than 400 species of these very collectable plants which are so easy to grow. Keep on planting for birds, bees and butterflies. Wild dagga, (Leonotis leonurus) September bush (Polygala myrtifolia), Egyptian star (Pentas lanceolata) bushes are highly recommended to make your garden come alive! It is prime time for hydrangeas, gardenias and fuchsias. If yours are not at their best, feed them with a water soluble fertiliser and renew the mulch around them. Plant out a fresh crop of sweet basil and also sow some seeds to ensure lots of these aromatic leaves for summer salads and pasta dishes. Remove all flowers as they appear to ensure good quality leaves, and to stop the plants from setting seed. Prune jasmines, banksia roses, deutzias, and spiraeas after they’ve flowered. Prune lightly those shrubs suffering from hail damage, and treat preventatively with a fungicide. Prune azaleas for neatness after flowering. Then give them a feed, water and mulch to help them set buds for the next flowering season. Prune ivy geraniums after a first flower flush. Keep on feeding them regularly to encourage another flower flush.